★ Convenient crank opens/closes system and push button tilt, even easy to use for kids and the elderly. Protect you from the sun in the daytime. 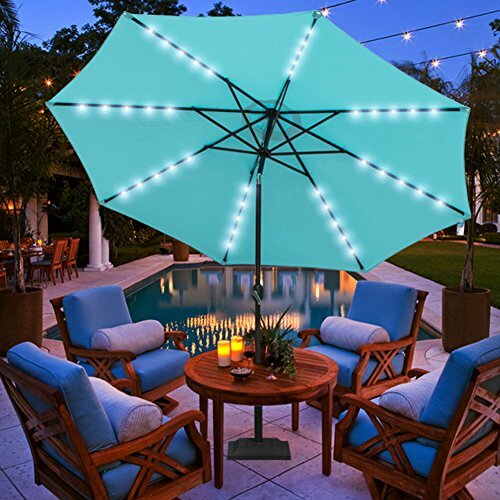 40 LED Lights with 8 steel ribs and 5 LED lights on each rib, help to light up relaxing night and create warm atmosphere. ★ 1.49in diameter rust-free bronze aluminum pole and 8 steel ribs provide stronger support. Air vented top enhances umbrella stability. ★ 100% polyester canopy fabric features fade resistant, water repellent, UV protection. Provide a perfect shade for your patio, garden, deck, backyard, pool. Enjoy warm weather without getting burned.